Published: May 22, 2014 at 04:39 p.m. Updated: May 23, 2014 at 08:56 a.m.
Former Minnesota Vikings coach Bud Grant was the first in history to guide his team to four Super Bowl appearances. This came on the heels of six appearances and four championships in the CFL's Grey Cup finals. He was elected to the Canadian Football Hall of Fame in 1983 and the Pro Football Hall of Fame in 1994. Much like baseball Hall of Famer Dave Winfield, Grant was a multisport star at the University of Minnesota. To date, Grant is the only person to take his team to the Super Bowl and win an NBA championship. In fact, he's the only player to participate professionally in the NFL and the NBA. According to the St. Paul Pioneer Press, Grant is advertising his "biggest, best and last garage sale" this week in Bloomington, Minn. 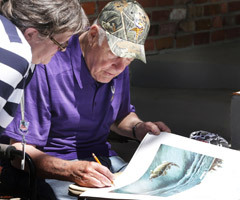 This will be the 10th garage sale for the 87-year-old, who is offering "one of kind" items from his personal collection, such as Vikings memorabilia and a signed picture of the 1950 champion Minneapolis Lakers squad featuring teammates George Mikan, Vern Mikkelson, John Kundla and Swede Carlson. Grant's final purge got us thinking about which NFL items might attract the most interest in a rummage sale. Below is our list. Feel free to throw out your own suggestions in the comments section.